Police were last night hunting two daredevil pilots who flew their small planes under the biggest bridge in the Highlands. 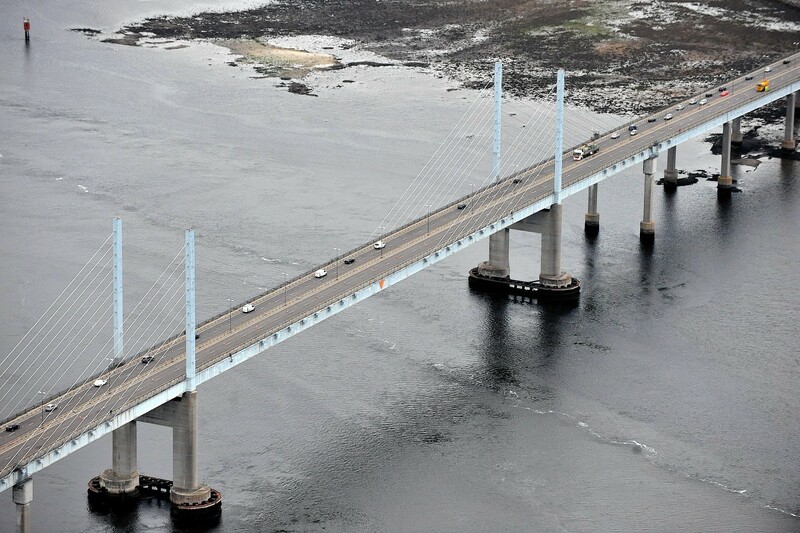 Shocked witnesses watched in horror as the light aircraft headed towards the Kessock crossing at Inverness – then ducked under it as traffic rumbled overhead. One eyewitness said he feared at one point the pilots were going to deliberately crash into the bridge, which carries thousands of vehicles every day. The two aircraft – which flew in from the Craig Dunain hill north of the Highland capital – were initially accompanied by a seaplane. But it wheeled away as the other pair went under the bridge, which has a 90ft clearance between the water and the road deck. Police said last night they were carrying out inquiries into what they described as “unofficial aeronautical acrobatics”. A flying instructor said that, legally, pilots must not intentionally fly within 500ft of any obstacle. One local man was sitting in his car at the Kessock slipway when the bizarre incident unfolded. He said: “There were three light aircraft and one was a seaplane. The seaplane seemed to bank away but the two others continued and went under the bridge. He said they were single-engined planes – possibly Cessnas – painted white with red flashes. He added: “Perhaps I watch too many films but I thought for a minute ‘are they going for the bridge?’. One resident at Scorguie, which overlooks the bridge, said: “My wife pointed out that someone could have crashed their car if they had seen planes coming straight for the bridge. “It looked like an incredibly dangerous thing to do. I could not believe it. “They were very close together and we were concerned that they might hit each other. The aircraft were flying through Inverness Airport’s airspace at the time of the incident. Transport Scotland also has a live traffic camera positioned on the bridge, but the agency declined to comment on whether the device had captured any footage of the stunt. A police spokesman said that inquiries were ongoing. He said: “Police in Inverness received a report from a member of the public regarding an incident of possible unofficial aeronautical acrobatics when three planes were seen flying past the Kessock Bridge. “Two of the planes were reported as having flown beneath the bridge, before meeting up with the third plane and continuing on their flight path. A Civil Aviation Authority spokesman said that agency was aware of the incident. He added that it was liaising with police but was not formally involved in the investigation. But one aviation expert said: “It would be unusual for aircraft to be flying under the bridge unless they have permission from air traffic control. “Those planes would have been under control from Inverness Airport. Police have urged anyone with information on the incident, which happened shortly after 1pm on Tuesday, to contact them on 101.